The Business of Preschool: How a better early learning experience builds a stronger economy. Please join us for breakfast May 10, 2019. Dr. Michael Martin, President of Florida Gulf Coast University speaks about the importance of a high-quality early learning experience. You might be surprised to learn how investing in good preschools will pay dividends for our community in the future. 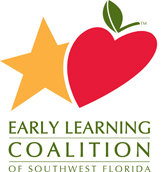 We also honor Waterman Broadcasting's Gerry Poppe as an ELC "Early Learning Champion".